2 lg. fennel bulbs, cored and thinly sliced, Fronds Chopped and reserved. Heat 1/4 cup Extra Virgin Olive Oil in a large pot or soup kettle over medium high heat. Add onion, fennel slices and garlic. Sprinkle lightly with salt and pepper. Saute until onion and fennel are tender, stirring frequently and adjusting the heat if the vegetables are browning too quickly. About 10-15 minutes. Add tomatoes with juice and 2 cups of broth. Bring to a boil. Reduce heat and simmer, covered, until the vegetables are very tender and the flavors melded. About 15-20 minutes. Stir in crabmeat. Add more broth to the pot, in 1/4 cupfuls to slightly thin soup or to bring to your favored consistency. Simmer for just a few minutes, 5-6, to heat crab through. Season to taste with salt and pepper. Duvude soup into bowls, sprinkle with chopped fennel fronds, drizzle with a small amount of Extra Virgin Olive Oil, and serve with the thick slices of Italian Bread toast. 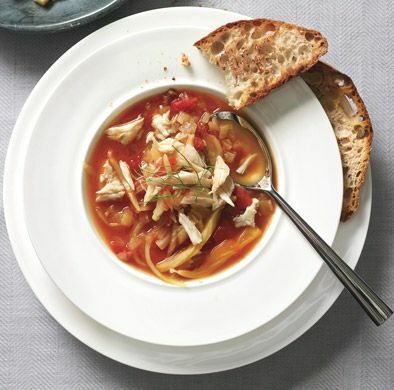 This crab soup was a favprote of ours, especially during the crabbing season. I can recall rising early on a Saturday or Sunday and heading to "South Beach" to crab all morning and bring home bushels of fresh , live Blue Crab. We had crabmeat tomato sauce the next day, and this soup during the week sometime, and an array of crab dishes during the rest of the week. No freezer yet! We cooked it and ate it like there was no more crab anywhere in the world! Oh, yes. The night we brough home the crab, it was steamed crabs for dinner! Who said Maryland had a lock on steamed crabs?